With her very first sentence, Alice Boase enlists the sympathy of every ex-colonial child. "To the best of my knowledge", she wrote "I had never set eyes on the woman whose attentions I was determined to resist". How many of us, abandoned, as we believed, to the care of relatives in England, had stared in disbelief at some strange person we knew we must call Mummy, but who also seemed, unaccountably, to have the right to tell us to go to bed. We never understood, how could we, the agonies this stranger had suffered during three, four, or even five years of separation from her children. Born in 1910, Alice Boase was only two years old when her parents left her to voyage up mosquito-humming rivers and hammock-laden trails to a magistrate's job in presentday Malawi. They had been there since 1901, long before the days of trains or aeroplanes, but, the difficulties of transport aside, their lives were not so very different from what many of us experienced before, and even after the second world war, and which were deemed quite unsuitable for white children. When Alice Boase's father had asked a Colonial Office official how they were supposed to get to Nyasaland, he replied vaguely, "Oh, take a boat to Aden and then go overland" (shades of my own Colonial Office interview when it was suggested that being so tall would help me "dominate the natives"). And once in Nyasaland, the absence of amenities like running water and electricity meant, at the turn of the century as in the 1930s, constipation-inducing pit-latrines with snakes at the bottom, refrigerationless wire-meshed meat safes, blackened wood-burning Dover Stoves and inadequate water tanks collecting rain from baking corrugated iron roofs. These and many other insights into the colonial life are, for those who shared them, the greatest attraction of Alice Boase's posthumous memoirs. A later section of the book, chronicling the distinguished legal career of her brother John is perhaps of less interest, with its standard recitation of postings and duties. After her father moved to Uganda as Chief Justice, Alice married her medical officer husband and stayed there until 1956, when Arthur Boase joined the St. John's Eye Hospital in Jerusalem. They thus missed Uganda's Independence in 1962, but Alice was nevertheless very much involved in the early stirrings of democracy in Uganda, first as a member of the Municipal Council and then as an appointed member of the Legislative Council (the fiedgling parliament). She was also, along with my own (Andrew's) mother, a founding member of the Uganda Council of Women, a body of formidable ladies of all races, which emphatically disproved the myth of the subordination of women in Africa. How Alice combined all this with raising a family of ten children was a mystery to us all. Although I (Patricia) was also brought up in Kampala in close proximity to the elder Boase children, they were always an enigma. We assumed that there were so many of them that they looked after each other and did not need much independent company. And yet a contribution to the memoir by David, Alice's second son, suggests a less cohesive group. "We had long shaken off the control of the Ayah and Mum and Dad placed no restrictions on us, probably because they could not be enforced". Another admission by Alice herself perhaps provides a further, but equally puzzling clue. She twice admits that she never really liked living in Africa and was rather relieved when they left. This we find astonishing. How could she have been so involved, beyond any conceivable call of duty, in the public affairs of Africa as well as what must have been the overwhelming private needs of her huge family, (which was the despair of every Public Works Department official who tried to house them)? So, at the end, Alice Boase too remains an enigma. Maybe it was her early experience of thwarted affection that deprived Alice, like others, of some of her roots and that abiding attachment to places and people that more fortunate children enjoyed? If so she has our renewed sympathy. 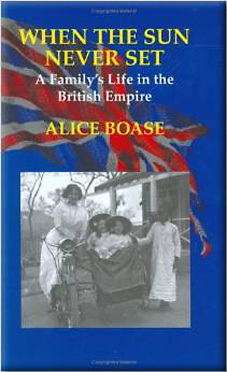 This is the story, spanning four generations and nearly three quarters of a century (from 1901 to 1973) of the devotion of Mrs. Boase's family and herself to the Colonial Service; her parents, brother - now Sir John Griffin, QC and one-time Attorney- General in Hong Kong, a married niece and herself. With her parents in the Entebbe she loved, she met and married a newly-fledged recruit in the Colonial Medical Service. They were to serve many years in Uganda. The author describes graphically the long and hazardous journeys between Stations and the details of everyday life in the Colonies. One can but salute that band of women, untrained even in basic household management (as so many of them were in the pre-World War II years) who took off into what was then the vast unknown, far removed from accepted conveniences and amenities. Their new lives were often perforce idle and boring, lonely and self-sacrificing. The houses provided were primitive more often than not, invaded by hordes of destructive or malaria-carrying insects; separation from their children was usual and frequent changes of Station meant leaving behind any friends they had made. The social life was narrow and the formalities rigidly observed. There were no rewards financially for salaries were small. Yet many still look back with nostalgia on those days. This book will enable them to re-live their own half-forgotten experiences. Non-Service readers will also find this picture of a vanished way of life of great interest. It is a valuable contribution to the history of the Colonial Service.